I don’t remember my first visit to Ricatoni’s Italian Grill, but over the year’s I have dined there many, many times. I have celebrated numerous friend’s birthdays at the restaurant, as well as my own. I’ve dined there with new friends and old friends, co-workers and one time a really awkward date. When I graduated from college Ricatoni’s is where I came to celebrate and two years later, when my brother graduated, we went again. It is comfortable and familiar. Though I am sure it has changed over the years, the general ambience is always the same and it feels a bit like going back home. I say all of this because I cannot give an unbiased review of the restaurant, as I love it too much and will fail to see it’s faults, if their are any. 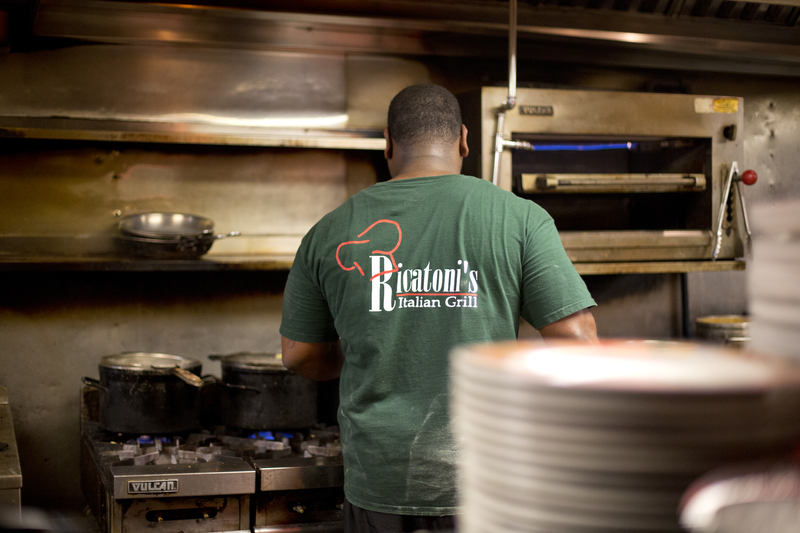 Ricatoni’s Italian Grill opened in 1996. The resturant was created by Rick Elliott, also known as Ricatoni Valentino. It’s been a few years since I’ve lived it Florence, but when I was in college Ricatoni’s had the most wonderfully eccentric advertisements on television. That brings back memories! I don’t know Rick personally, but he must be fun at a party! 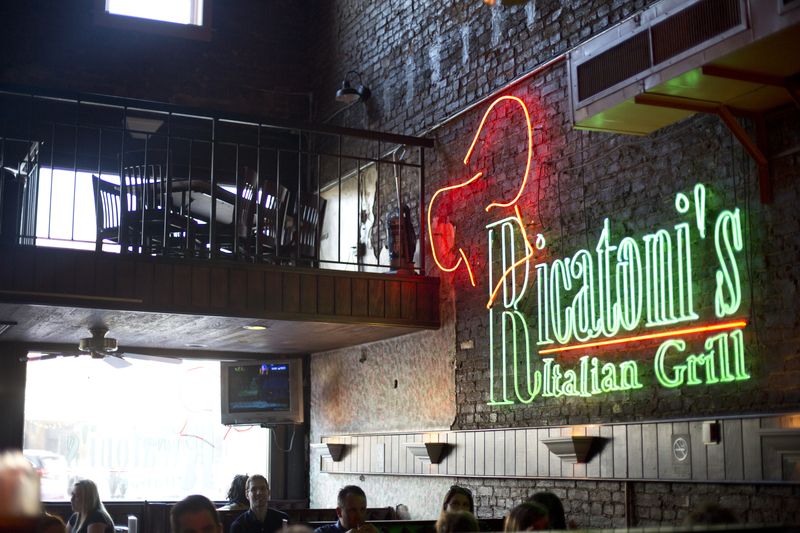 Ricatoni’s has a fun, social ambience. 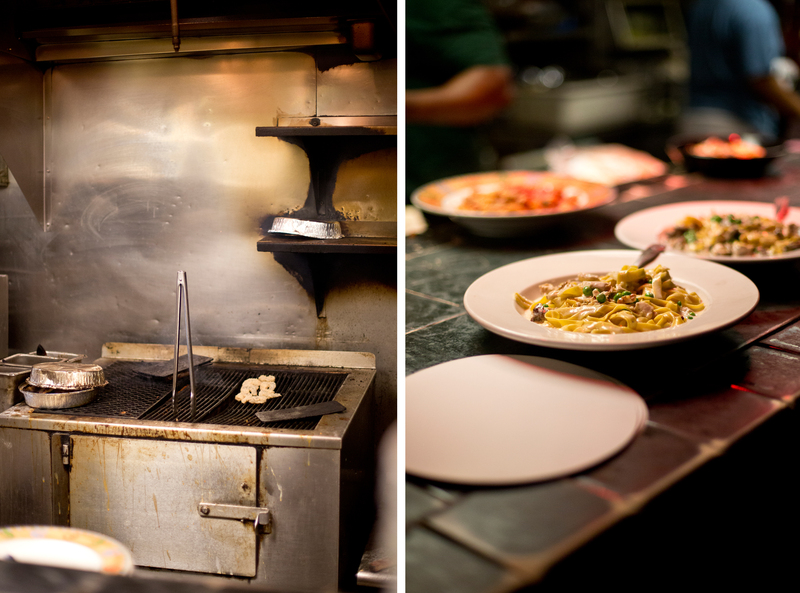 It is a narrow restaurant with an open kitchen so you can see your meal being cooked and plated. The servers are always pleasant and the food is always tasty. 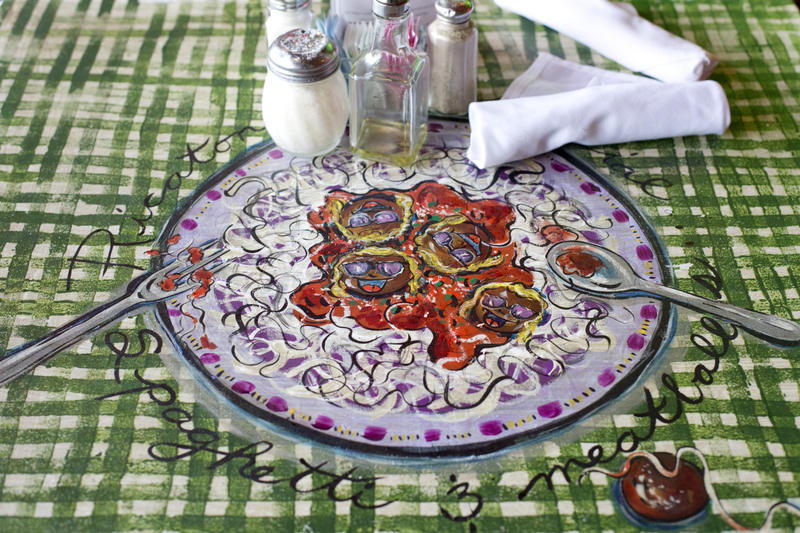 There are fun touches throughout the restaurant, including local artwork, murals and uniquely painted tables. I notice that the table next to us had spaghetti and meatballs painted on it. I could be wrong, but I believe the meatballs had Ricatoni Valentino’s face on them. I’ve include a photo of Rick from the restaurant’s website next to the meatball. You be the judge. When you first sit down the server always brings you a white paper bag filled with warm bread and a plate of herbs. 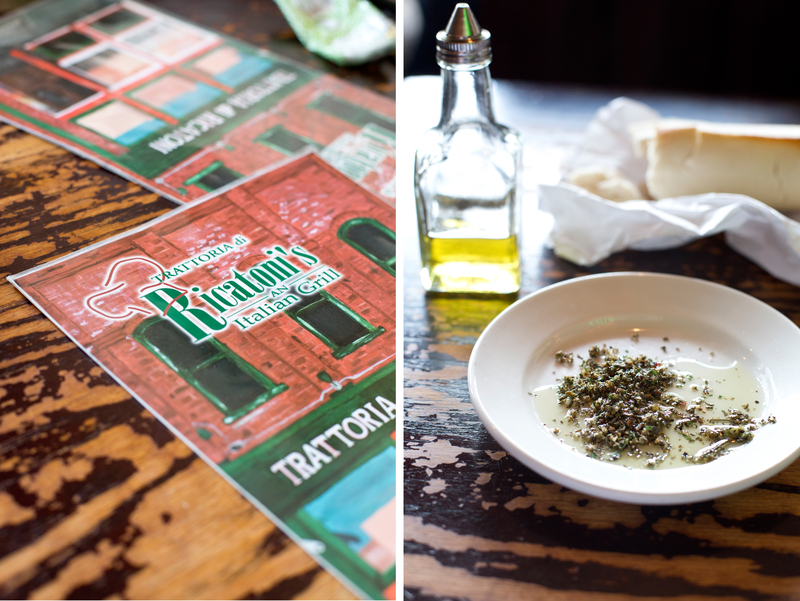 There is olive oil on each table to pour over the herbs and dip your bread in. We were going skip the bread (don’t want to fill up on the free stuff) and dine on our appetizer, but instead we ate the bread and still ordered an appetizer: Bruschette Ricatoni. 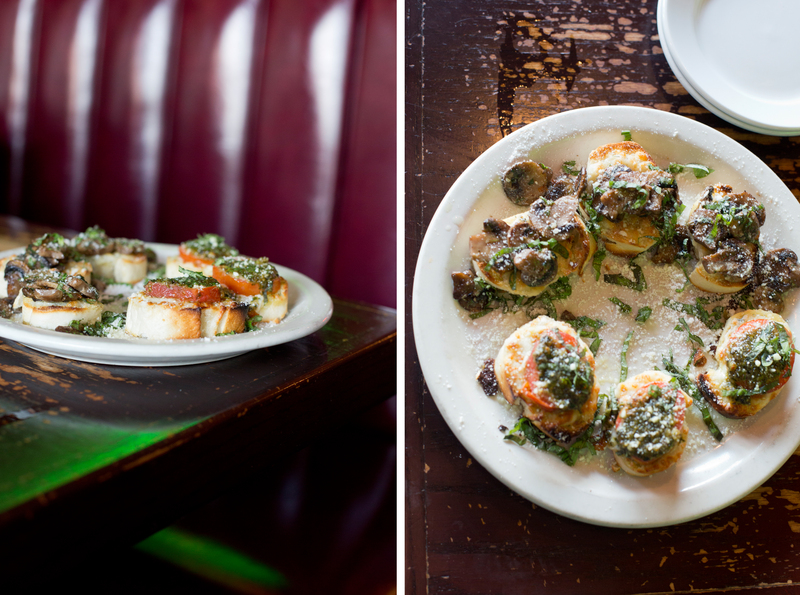 This dish had two types of bruschetta, a set with tomato and pesto and a set with mushroom and fontina cheese. Both were great! There seem to be many wonderful dishes on the menu, but I have never tried any of them as I always get the Ravioli Ricatoni. I say I’m going to try something new, but then I change my mind and go for the tried and true. 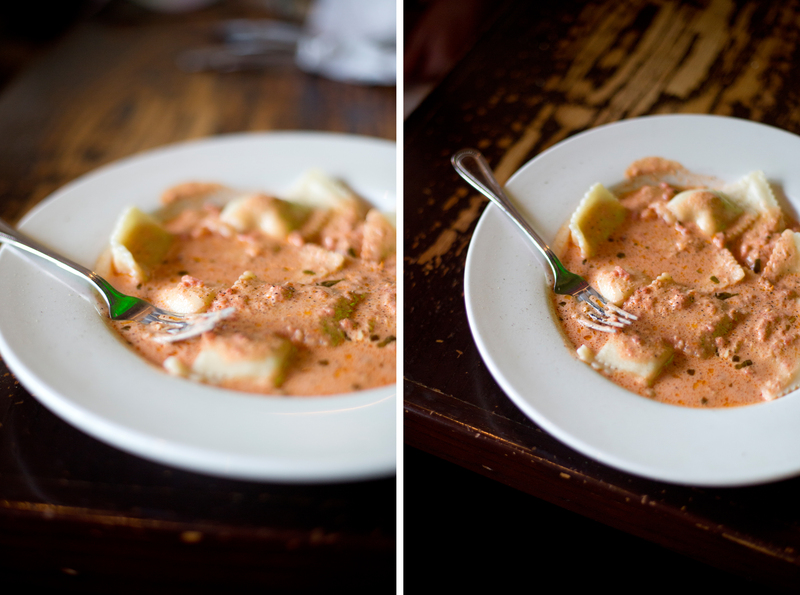 The ravioli is simple, creamy and delicious, the perfect comfort food. 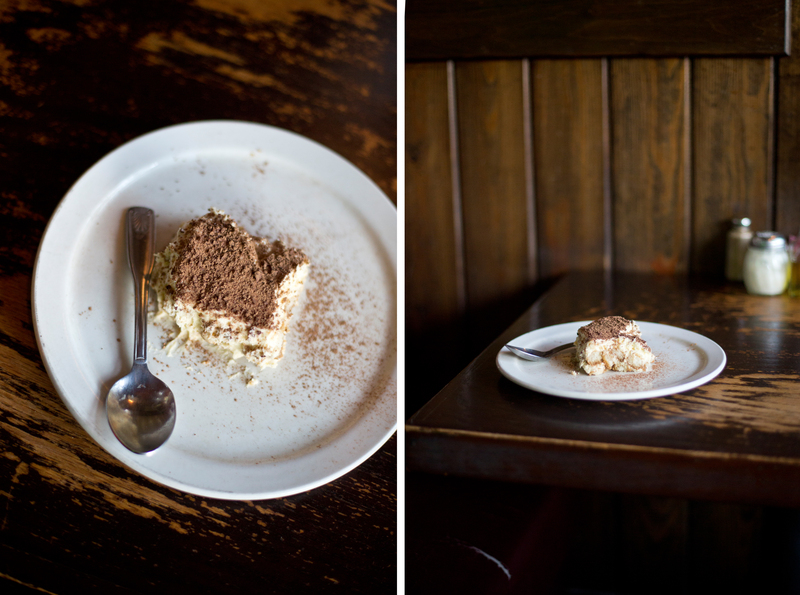 After a short debate we ordered the tiramisu, which was the perfect sweet end to Florence Restaurant week. Disclosure: I was invited to participate in Florence Restaurant Week by Florence Main Street. My hotel was paid for by them to make it easier for me to participate and I received a $20 gift card from Ricatoni’s Italain Grill. I paid the remaining balance out of my own pocket and all thoughts and opinions about the restaurant are my own. Categories: Food Review | Tags: #DowntownFlorence, #FRW2015, eat local, Florence, florence alabama, florence main street, florence restaurant week, italian, Ravioli, Ricatoni, Ricatoni Valentino, Ricatoni's Italian Grill, Rick Elliott | Permalink. hmm, good food, good place and good acompanion, what else to ask for ??? Thank-you so much! I found your page as well. Happy to be following you back! Thank you!! Have a lovely week! Slick Cheese (Jeff D). Do you remember when me and Barrett were there? Somebody got wet I remember. Good times for sure!